With TIBCO Spotfire® Analytics, your organization can seize new business opportunities and avoid risks with unmatched speed and flexibility. Using easy-to-use interactive dashboards, visualizations, and predictive and event-driven analytics, you can develop unexpected insights immediately on any device. Spotfire is an enterprise class analytics platform that helps both business and technical users quickly explore data to develop actionable insights, without requiring IT intervention. Spotfire’s easy-to-use visualizations enable users to quickly uncover answers to their initial questions, while revealing unexpected trends, patterns, and outliers that are hidden in data. Spotfire supports dimension-free data exploration to enable users to interactively visualize data without constraints, so they can quickly develop actionable insights. In addition, Spotfire uniquely enables users to create rich, multi-level map-based analytics to better understand geographic correlations in data. To get a complete picture of external and internal environments, Spotfire makes deep data exploration easy, empowering users to quickly combine disparate data sources, without custom scripting or requiring IT intervention. With Spotfire, users from across the enterprise can easily access data from analytical and relational databases, OLAP cubes, flat files, and enterprise applications, and integrate them into a comprehensive analysis of the entire dataset. Spotfire’s unique data on demand capability, and the ability to mashup database sources with in-memory sources, enables users to interactively swap massive datasets quickly and easily so they can develop insights masked by data silos or aggregations. Spotfire helps you anticipate opportunities and risks by seamlessly integrating predictive models and real-time event streams. It offers the best of both worlds: supplying powerful predictive analytics for the business user, and a broad array of cutting-edge statistical analysis tools for statisticians and quantitative analysts to rapidly prototype, develop, and deploy new analytic applications. Spotfire capabilities easily support a collaborative decision-making process—from spontaneous and freeform brainstorming, all the way to formalized decision workflow. With Spotfire, you can capture and securely socialize moments of insight, ideas, and hypotheses with peers, advisers, and customers. These rich discussions can be captured through collaborative bookmarks, commentaries added to KPIs on a smartphone or tablet, guided analytic apps, corporate portals, and social platforms, to provide visually compelling context to accelerate the decision making process. TIBCO Spotfire is the leading enterprise-class analytics and data discovery platform, providing unmatched performance, scalability, and security. Its differentiating hybrid in-memory/in-database analytics architecture supports the most demanding enterprise needs, easily scaling to thousands of users and limitless rows of data. Spotfire is deployed in the world’s largest companies in energy, financial services, manufacturing, consumer packaged goods, and life sciences industries. It works within existing IT systems and security models, and is backed by TIBCO’s global domain expertise and 24 × 7 customer service. • TIBCO ActiveSpaces® in-memory computing grid. Spotfire instantly visualizes, interacts with, and shares data to spot the buried opportunities and risks nobody else can see. By bringing the power of visualization-based data discovery to everyone in your organization, Spotfire grants independence from IT and other outside sources. Spotfire’s visualization-based system is win-win for all who want to find new opportunities that are visually presented in endless combinations that are easy to interact with or share. Create in minutes. Share in seconds. 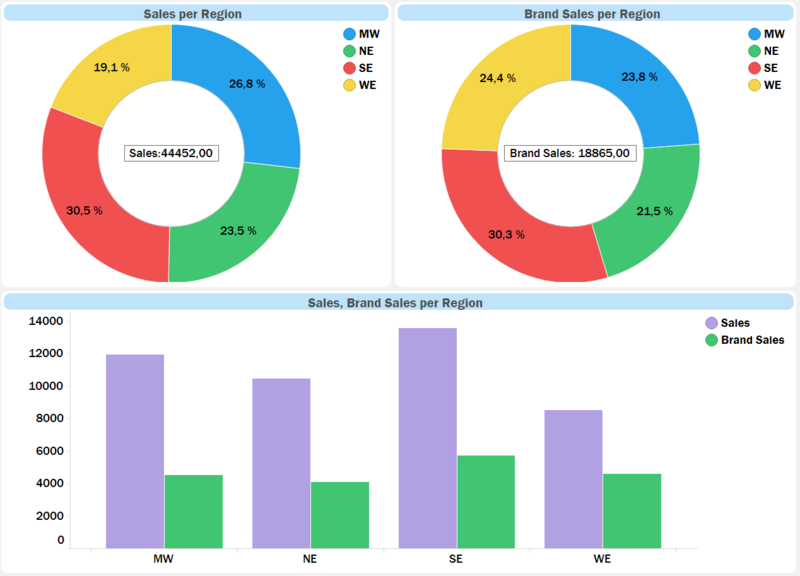 Creating operational dashboards and analytic dashboards has never been so easy. At Spotfire, we make it just as simple to share and publish them directly to tablets or desktops through a zero-footprint web client. And because these capabilities are role-based, the analyses are shared securely, are auditable at will, and are preserved over time. This method encourages exploration and collaboration by all with the presentation of a clear message through your impressive display of data. 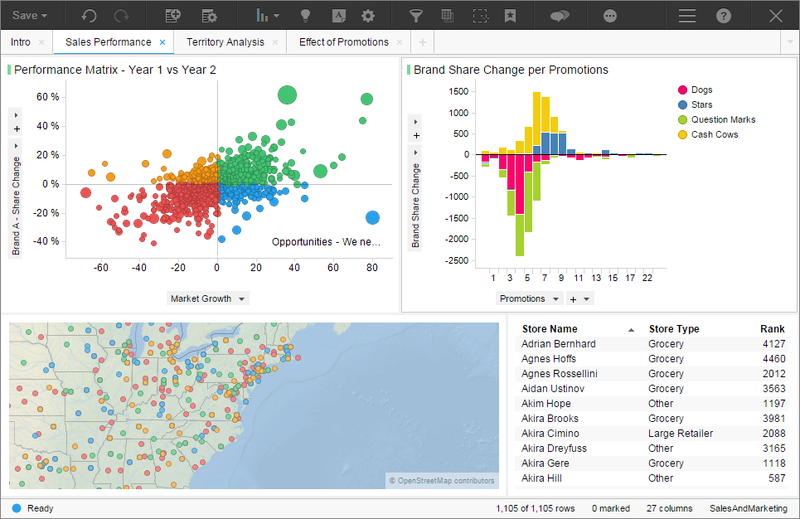 Predictive Analytics with TIBCO Analytics. Monitor the Pulse of Your Business with Mobile KPIs You operate in an intensely competitive global environment. To stay ahead, you need mobile access to business intelligence to make immediate, informed decisions about the most critical aspects of your business – anytime, anywhere. If you would like to schedule a demo, simply complete our quick request form.